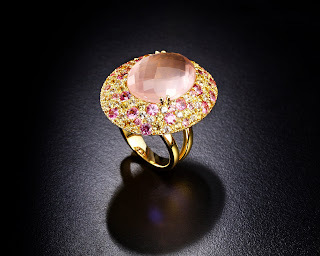 Editor's Lust List: Adriana Carador Jewelry | Fashion. Style. Beauty. | Life is short. Live well. In case the amount of accessories coverage on FSB hasn’t tipped you off, I am an accessories nut. I love jewelry and when I see amazing pieces I don’t think anyone should live without, I’m inclined to tell you. When it comes to investment pieces, I think every woman should have exquisite, well-crafted jewelry that is unique and speaks to the person wearing it. 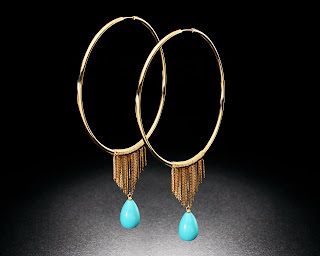 This is why I am in love with Adriana Carador Jewelry. A native of Sao Paolo, Brazil, Carador studied fashion in Rome before discovering her true love of jewelry and gemstones at home in her native South America. 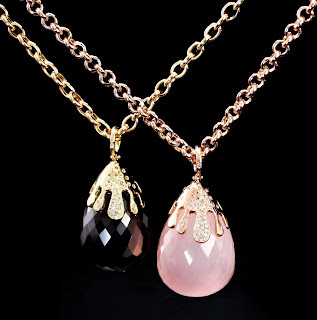 Carador’s pieces are inspired not only by the gems themselves but by everyday shape and texture inspirations like the melting ice cream look of her Cupilha pendants, 18k yellow or rose gold with smoky quartz or pink quartz teardrop stones accented with diamonds ($2700). Carador’s collection has gorgeous pieces ranging from her Samba hoops (24k gold and coral for $2300) to her estate-worthy rings like my personal favorite, the Briolette ring ($1900). Carador’s collection is available stateside in NYC at Fragments. If you’ve got the means to give Mom a serious Mother’s Day gift or even to treat yourself to some quality jewelry whose craftsmanship will stand the test of time, then I suggest a piece of Adriana Carador’s collection for a true statement of elegance and money well spent.